Have you ever wondered how the hundreds of black Beaty cabinets become filled with specimens? Beaty collectors include dedicated specialists from the community, who contribute dried specimens and detailed notes. 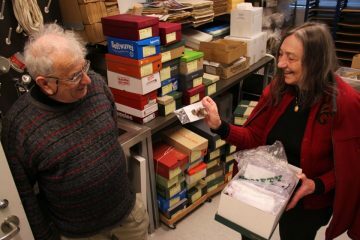 Two outstanding contributors, Oluna Ceska, a mycologist, and Adolf Ceska, a plant ecologist, both from Vancouver Island, arrived at the Beaty loading dock on March 31, 2014 with 52 shoe boxes containing 3312 new specimens of dried fungi, collected from 2010 to 2013. As a team, the Ceskas have been collecting, preserving and photographing fungi from British Columbia for over many years. Since the end of November 2004, they have been conducting a long standing project to inventory the fungi fruiting on Observatory Hill, Victoria, BC, where Oluna has identified over 1200 species fruiting on less than 75 ha site. This project has been supported by the Herzberg Institute of Astrophysics, Garry Oak Ecosystems Restoration Team, and anonymous private donors. This Observatory Hill project is unique in North America by its length and intensity of the survey. Ceskas’ most recent contribution to the UBC Beaty Museum was funded through a contract with the Canadian Wildlife Service, Environment Canada program, ‘General Status of species in Canada’. 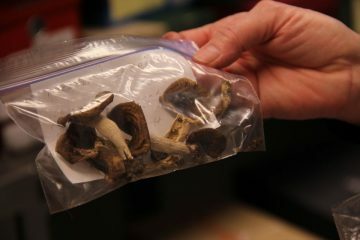 Over the past ten years, the Ceskas have been responsible for filling almost a fourth of those Beaty black cabinets that are dedicated to fungi, adding over 6400 specimens and bringing the number of fungal specimens in the Beaty museum to 26,771. Fungi are important to BC ecosystems as mutually beneficial mycorrhizal partners of our forest trees, and as decomposers that help to recycle nutrients. In spite of their importance, many mushroom species remain to be described. The inventory of BC species is strikingly incomplete and fungi are underrepresented in the Beaty. The Ceska collections provide the specimens needed to expand knowledge of the richness of BC species and ultimately, to understand how these species function in BC forests. Oluna showing Adolf one of the dried specimens. The shoe boxes in the background contain rest of the 3312 new Beaty specimens. An example of one of Oluna Ceska’s specimens.